A petty thief with an utter resemblance to a samurai warlord is hired as the lord's double. When the warlord later dies the thief is forced to take up arms in his place. During a sweltering summer, a rookie homicide detective tries to track down his stolen Colt pistol. A vengeful young man marries the daughter of a corrupt industrialist in order to seek justice for his father's suicide. A drunken doctor with a hot temper and a violence-prone gangster with tuberculosis form a quicksilver bond. 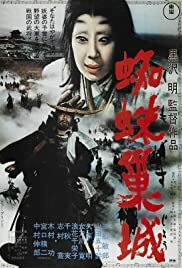 From the creator of "Rashomon" and "Ikiru"
As much as I praise Mifune, it may well be Yamada who stands out in Kurosawa's version of Macbeth. Her Lady Macbeth is one of the most terrifying things I have ever seen, a forerunner to Sadako. Dressed in Noh make-up, slow moving like the world's most effective predator, unblinking, she is, without a doubt, the true lady Macbeth. She turns Mifune towards murder, and, although she is seen going mad at the end, we do not see her die. The tragedy of the tale is heightened by the fact that we are told at the start what will happen. Every shot Kurosawa composes is memorable. The arrow through the neck, the thread spinning witch in the forest, Mifune turning his back on his master, all are haunting and unforgettable. This film cannot be praised enough, and although it is not a horror movie, it puts all modern horror movies to shame with its deadly atmosphere. Great Quotes: Asaji. Every samurai longs to be the master of a castle'. 10 out of ten.